"How do you know how much food to cook for 3,000 people before an athletic event?" Mary C-R. asked as she stacked multiple trays overflowing with enchiladas at the close of the Avon Two Day Breast Cancer Walk of July 10. "I was in the catering business for years, and even I don't know how you get that one right. Thank goodness for Food Runners," Mary continued. "I've been constantly frustrated by food waste over the years. I was thrilled to bits when I found Food Runners." 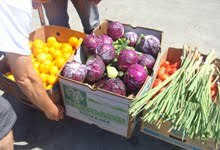 Food Runners picked up nearly1,000 pounds of food from the Avon Walk that day thanks to Mary. "I was on my morning run outside the Mission district and noticed someone carrying trays and pans of various sizes into a building from a truck labeled "Food Runners"; obviously a donation. I walked inside my house, flipped open my laptop and looked up "Food Runners." The rest, as they say, is history." History indeed. Mary signed on as a Food Runners volunteer that day. 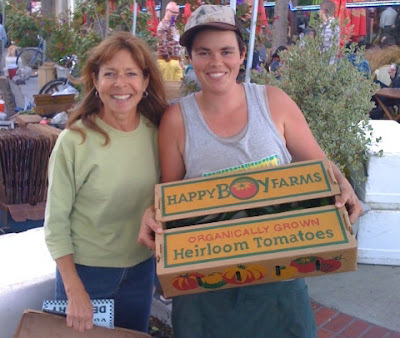 Within a week or two of doing her first food run, Mary and her partner Jonathan volunteered for a regular gig at the Castro Street Farmers Market. 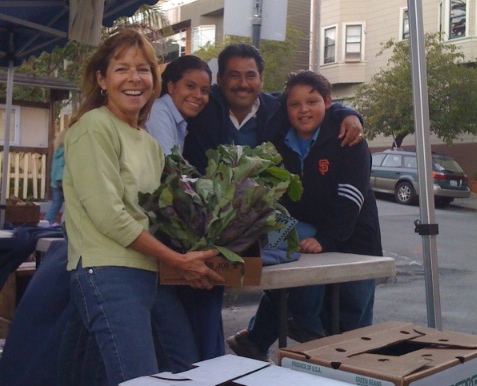 Every Wednesday evening, as the sun sets over Twin Peaks, Mary and Jonathan gather generous donations of farm fresh produce from the market's vendors. Summer and early fall are particularly bountiful often filling Mary's car to the bursting point. 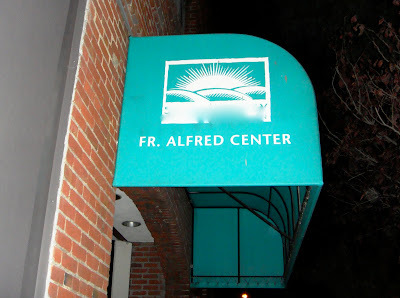 Mary and Jonathan deliver the treasure to the very appreciative Father Alfred Center in SOMA. In addition, until this week, when a new job changed Mary's schedule, Mary ran food on Mondays from Rainbow Grocery to Clara House, a ladies shelter in the Western Addition. "I really LOVE that run," Mary lamented. "I'm so sorry to have to give it up." "Every week since I joined Food Runners," muses Mary, "I have felt humbled as well as fulfilled to know that I have this small chance to give back to the community that has, for years, and still does, support me." Food Runners feels humbled in return to have a citizen like Mary in its ranks. Long may she volunteer. Food Runners welcomes new donors Square Up and Craigslist both of whom are donating the surplus from their in-house meals on a weekly basis. What happens to the leftover food from your company's in-house meals? How about all the hot dogs and potato salad that won't get consumed at this year's company picnic? Call Food Runners, 415-929-1866. Help your company be green and community focused. Making a difference is so easy. "How do you know how much food to cook for 3,000 people before an athletic event?" Mary R. asked as she stacked multiple trays overflowing with enchiladas following the Avon Two Day Breast Cancer Walk of July 10. "I was in the catering business for years, and even I don't know how you get that one right. Thank goodness for Food Runners," Mary continued. "I've been constantly frustrated by food waste over the years. I was thrilled to bits when I found Food Runners." Food Runners picked up nearly 1,000 pounds of food from the Avon Walk that day thanks to Mary. History indeed. Mary signed on as a Food Runners volunteer that day. Within a week or two of doing her first food run, Mary and her partner Jonathan volunteered for a regular gig at the Castro Street Farmers Market. Every Wednesday evening, as the sun sets over Twin Peaks, Mary and Jonathan gather the generous donations of farm fresh produce from the market's vendors. 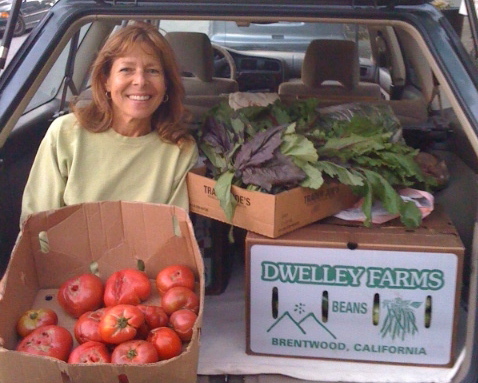 Summer and early fall are particularly bountiful often filling Mary's car to the bursting point. Mary and Jonathan deliver the treasure to the extremely appreciative Father Alfred Center in SOMA. In addition, until this week, when a new job changed Mary's schedule, Mary ran food on Monday mornings from Rainbow Grocery to Clara House, a ladies shelter in the Western Addition. "I really LOVED that run," Mary lamented. "I'm so sorry to have to give it up." Food Runners is now on Twitter! Start following today. Food Runners on Facebook coming soon.